Chiropractic care not only helps injuries heal faster, but it can go a long way in preventing them and in keeping the body healthy. Countless professional athletes in every sport rely on chiropractic care to stay in peak physical condition so that they can perform at the highest level. Here are 16 current and former professional athletes who rely on chiropractic to keep them healthy. Considered to be one of the best baseball players of all time, the former left fielder played 22 seasons with the Pittsburgh Pirates and San Francisco Giants, earning several Major League Baseball (MLB) hitting records, including most career home runs (762).1 Following an injury during training, he sought chiropractic care and was amazed by the results. The 12-time All-Star third baseman with a famous chicken-eating habit, Wade Boggs, is something of a legend in baseball. Throughout his 18-year MLB career, he amassed 3,010 hits and 118 home runs. Boggs, who was inducted into the National Baseball Hall of Fame in 2005, reached base safely in 80 percent of his career 2,432 games.3 After suffering with severe back pain for nearly 10 years, he was treated by a chiropractor, Dr. Craig Newman, DC, and made a full recovery. Michael Jordan is arguably the best basketball player in NBA history. Drafted by the Chicago Bulls in 1984, Jordan played 13 seasons in Chicago before retiring. He returned to basketball in 2001 to play for the Washington Wizards for 2 years before his final retirement from the game. His list of athletic achievements is long, ranging from being named the NBA’s most valuable player (MVP) 5 times to winning 6 NBA championships and even scoring 69 points in one game. Michael Jordan also holds records for the Bulls in scoring (29,277), assists (5,012), and steals (2,306).5 He is a firm believer in chiropractic and attributes part of his success to the care he received. One of the best current professional basketball players, Derrick Rose, was named the NBA’s league MVP in 2011, the youngest player (22 years old) to ever receive the honor. Prior to starting his career in the NBA, Rose was ranked the best high school point guard in the nation his senior year, averaging 25.2 points per game. He played one year of college ball at the University of Memphis before being drafted by the Chicago Bulls in 2008. He earned Rookie of the Year during his first NBA season and averaged 25 points per game over the next 3 years.7 After some severe back spasms that forced him to miss 5 games, Rose was introduced to chiropractic care. One of basketball’s great point guards, John Stockton of the Utah Jazz, is probably best known as the top passer in NBA history. By the end of his career, he had amassed 15,806 assists. But he wasn’t just good at giving the ball away; he also led the league in steals twice, finishing his career at 3,265.9 Also impressive is that “Jazz players missed very few games due to injury,” a feat that Stockton attributed to the team chiropractor, Dr. Craig Buhler, DC. Drafted by the New York Knicks in 1985, Gerald Wilkins spent 13 seasons in the NBA, playing also for the Cleveland Cavaliers, the Vancouver Grizzlies, and the Orlando Magic.11 Throughout his career, Wilkins was known as a great defender. He also asserts that chiropractic care improved his skills. Austrian-born bodybuilder, movie star, and politician Arnold Schwarzenegger has achieved a great deal of success in his lifetime. Always the athlete, young Arnold picked up a barbell for the first time at age 13 during team soccer training. He decided then that he would devote his life to fitness.13 Schwarzenegger attributes much of his success to the chiropractic profession, and he has promoted chiropractic throughout his career, even as the governor of California. A highly recognized name in boxing, Evander Holyfield began his career in 1984 as an Olympian; he took home the bronze medal. In 1990, his victory over Buster Douglas earned him the title Undisputed Heavyweight Champion of the World. He would go on to win 4 more heavyweight championships, making Holyfield the only 5-time Heavyweight Champion of the World.15 He considers chiropractic care essential to his success. Hall of Fame quarterback Joe Montana played 16 seasons in the NFL before retiring in 1994. Regarded as one of the greats, he led teams to victory from behind in the fourth quarter a total of 31 times, earning him the nickname, the comeback kid.17 Montana credits his success, in part, to chiropractic care, even being treated by a chiropractor in front of a live audience during Super Bowl XXIII in 1989. Jerry Rice — widely considered one of the best wide receivers in football — played 20 seasons, more than any other wide receiver in NFL history. As a spokesperson for the Foundation for Chiropractic Progress, Rice attributes much of his success and the longevity of his career to chiropractic care. A 4-time Super Bowl champion, Bill Romanowski was a linebacker in the NFL for 16 seasons. He credits his chiropractor, Dr. Craig Buhler, with helping him avoid missing a single game throughout his career. The iconic Dallas Cowboys star, Emmitt Smith, was one of the best running backs in NFL history. During his 15 seasons, he broke several records, including all-time leading rusher (18,355 yards) and all-time rushing touchdowns (164 touchdowns). Since retiring from professional football, he has accomplished a lot, like serving as a football analyst for ESPN and the NFL Network, appearing on ABC’s popular reality show Dancing with the Stars, managing several companies in real estate and construction, writing books, and providing educational opportunities to underserved youth through his outreach program Pat & Emmitt Smith Charities.24 While in the NFL, Smith visited a chiropractor regularly. Ronda Rousey has received a lot of attention lately — and with good reason. As the first and current Ultimate Fighting Championship (UFC) Women’s Bantamweight Champion, she is regarded as the best female mixed martial arts fighter in the world. Rousey has won every fight in the first round. She even became the first American woman to earn a medal in judo at the Beijing Summer Olympics in 2008.31 She credits Dr. Sarkis Cholakyan, DC, with helping her perform her best. 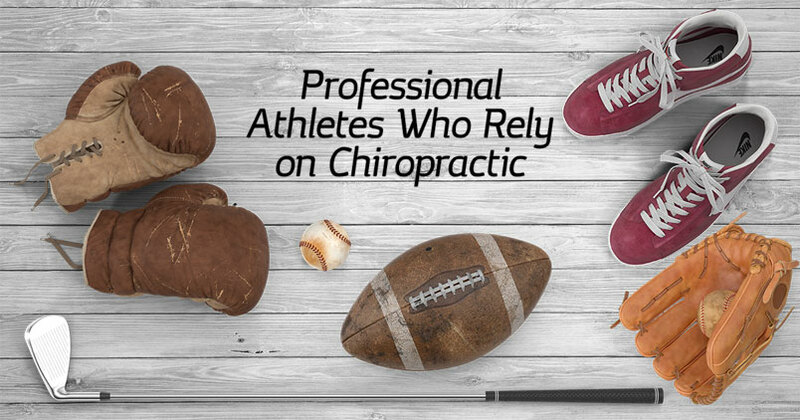 These top athletes — and many more — trust their chiropractors to keep them on the field, in the ring, and on the court. Many teams even bring at least one chiropractor with them when they travel. Professional athletes know how to stay in prime condition, and that’s with regular chiropractic care. Whether you’re an athlete or just prefer to watch from the sidelines, chiropractic care can help you stay well, too! Call (615) 751-0958 today to schedule your next chiropractic appointment with one of the five experienced doctors of Batson Chiropractic Group. Or click here to request an appointment online!